After repeating these phrases, each student answered a set of questions unrelated to the study. These questions, however, were only a distraction — what they didn’t know is that the study was only beginning. Simply A Choice Of Words? As each student walked out of the room and handed in their answer sheet, they were offered a complimentary treat. The student could choose between a chocolate candy bar or a granola health bar. As the student walked away, the researcher would then take note of what the choice was. The students who told themselves “I can’t eat X” chose to eat the chocolate candy bar 61% of the time. The students who told themselves “I don’t eat X” chose to eat the chocolate candy bars only 36% of the time. “I don’t” is experienced as a choice, so it feels empowering. It’s an affirmation of your determination and willpower. “I can’t” isn’t a choice. It’s a restriction, it’s being imposed upon you. So thinking “I can’t” undermines your sense of power and personal agency. 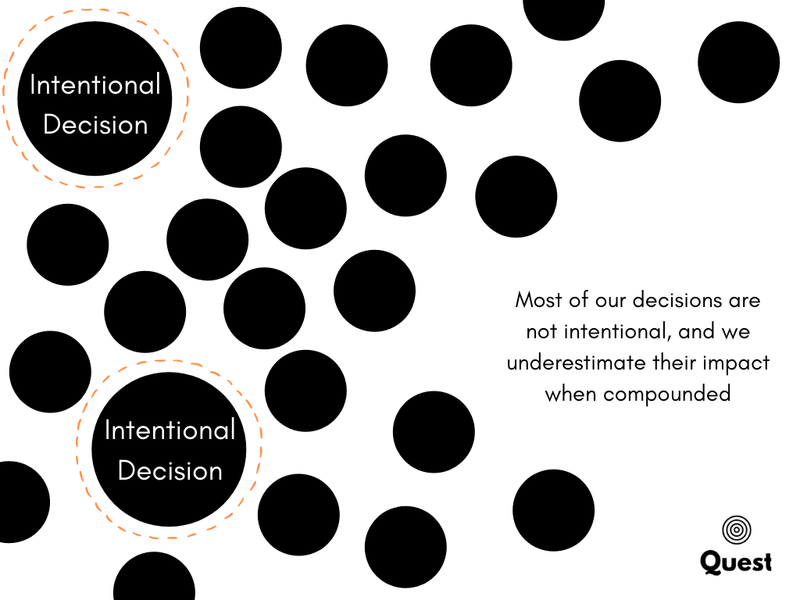 We like to think we are all rational people, who reflect and control every decision that we make — but that is never the case. We not only suffer from a number of cognitive biases and decision-making flaws, but also from our biological limits. We are not machines. Our attention is a limited resource, and that forces us to prioritize and think rationally only for the most important decisions. I won’t make a 30-minute analysis of all of the pros and cons of buying an ice-cream every time I see one — I will either buy it or not, as I can easily justify any of the choices. But if most of my time I’m making automatic decisions that are heavily influenced by my thoughts, habits and environment, how can I make any lasting change in my life? How can I avoid buying the ice-cream without having to make any intentional effort? While I can’t consciously be “a healthy person”, or a more productive person or anything else, I can set my irrational self to behave in that way. That is, I can consciously shape my identity. 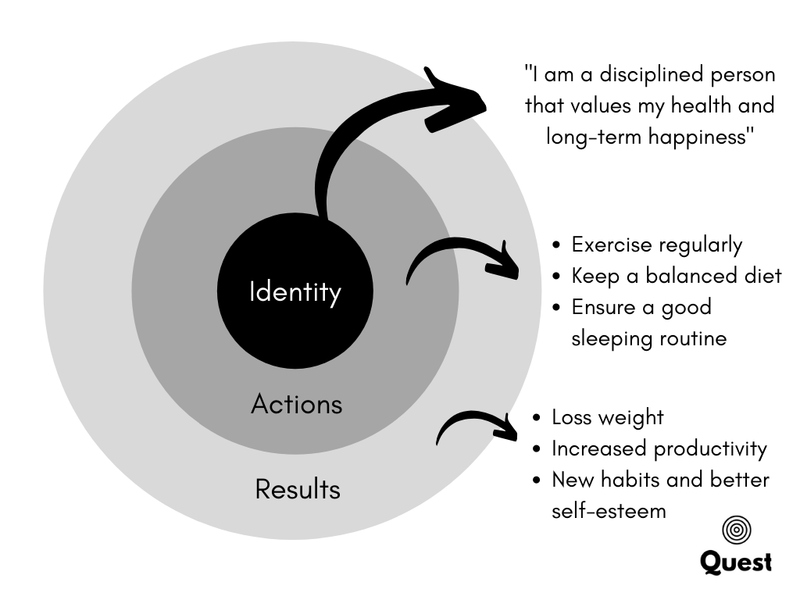 When we consider all of the factors that control our habits and day-to-day decisions, identity stands as the most important one. There are certainly a number of other things that play a role, from our environment to who we spend our time with, although in practice we can consider those as manifestations of identity. My identity affects who I choose to spend time with and what sweets I usually eat, or if I even choose to eat sweets at all. “Losing weight” is an action that requires intention and motivation to be executed, and does not guarantee long-term effects. “Being a person who values their health”, on the other hand, is an identity level change that will impact your habits and behaviors as a whole. Once you become a person who values your health, then you will just keep eating healthy — you won’t need willpower or motivation to force yourself into it. Someone who sees himself as a drug addict (instead of having a drug addiction) will not believe that he can change long-term, and this will control his behavior. 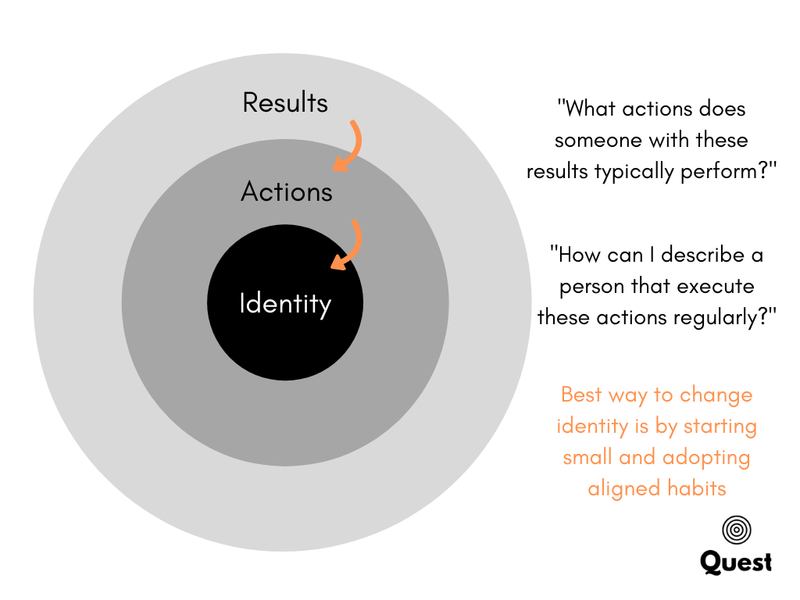 That is why if we want lasting change and long-term results the most effective thing to focus on is on identity — if we make it right everything else takes care of itself. As we develop new beliefs about who we are, our behavior will change to support the new identity. 1. Decide who is the person you want to become. 2. Convince yourself with small and regular wins. First, decide who you want to be. What are your principles and values? Who do you wish to become? Many people can feel lost and intimidated with these big questions. For those who don’t know where to start, we can always use the inversion technique: You may not be able to talk about your current identity, but you do know what results you want: to build big muscles, to find a partner or to finally make a change in your business. Identity: Become someone who never misses a workout. Small win: Do 3 pushups every other day during the a week. On the next week increase it to 4, and on the next to 5. In a month you’ll be able to see results, and soon you’ll realise how it has become a fundamental part of your routine. Want to find a partner? Identity: Become someone sociable and who always meet new people. Small win: Every week, start one conversation with a stranger. Every weekend, go out with friends and be open to talk to new people. Want to stop delaying and finally make that important change in your business? 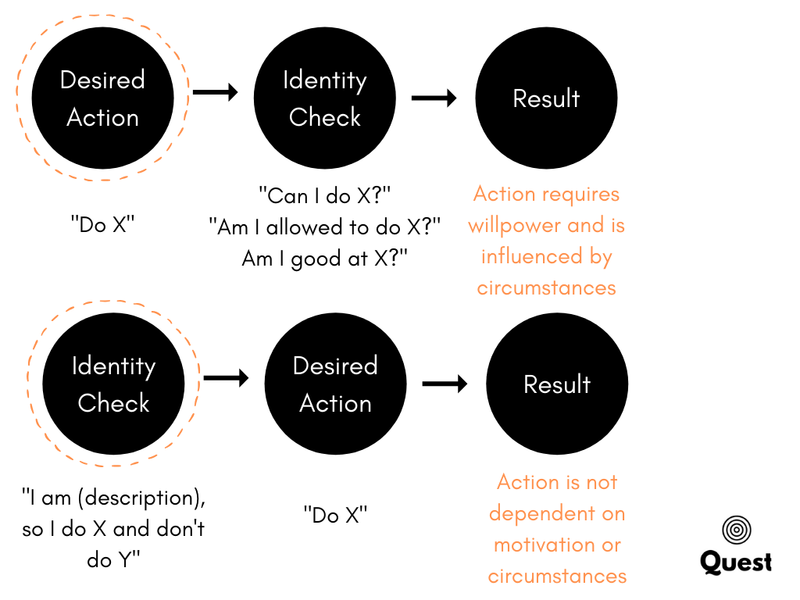 Identity: Become someone who moves from though to action, and invest in continuous improvement. Small win: Join a coaching program that will push you to execute and accelerate your initiatives, or share your idea and goals with friends and ask them help to keep you accountable. 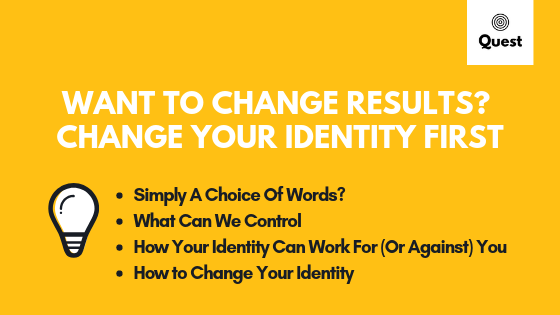 When you start out, convincing yourself of your new identity is more important than getting the results you are after. Trust the process — focus on becoming the person who can hit your goals first, and let the results take care of themselves. Or, browse our best articles. I’m a location-independent management consultant with over 8 years of experience, including business process design, operations and strategy.